The “click-to-clean” (also called “push-to-clean”) tools are for SC, LC, MPO and all the other popular fiber optic connector configurations. These high-quality products have the most gentle activation on the market and the longest “throw” of cleaning ribbon. This means they deliver perfectly clean connectors with just one activation which results in faster, less expensive cleaning with minimal risk of damage to the end-faces or ports. This "click-to-clean" system is ideal, and most cost effective, for routine cleaning with a high volume of connectors. 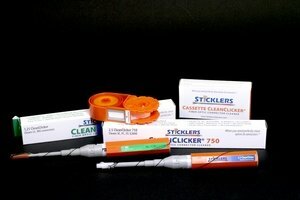 For fewer or single connectors, and for highly contaminated end-faces, we recommend the Sticklers CleanStixx™ fiber optic cleaning swabs. The cassettes are ideal for all end-face cleaning.